Paeonia Brother Chuck, named after the brother of famous breeder Roy Klehm, is a real looker, thanks to its large buds that can grow to be a colossal 40 mm wide! This amazing peony variety gets even more impressive when it starts to bloom. The flowers of this variety are filled with petals that are salmon, cream and even champagne-coloured. An unmissable spectacle that no peony fan should miss. 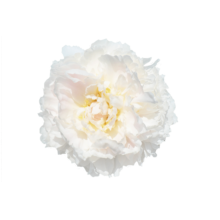 Brother Chuck is a double-flowered peony with flowers that bloom in the shape of a rose. The variety blooms early mid-season. The leaves are beautifully dark green and strong and the stems are sturdy enough to carry the huge pastel coloured flowers. Paeonia Brother Chuck was registered in 1995 by Roy Klehm and is a tribute to his brother Chuck, a fellow peony enthusiast. Brother Chuck is a formidable peony that needs a lot of strength to successfully bloom. Make sure to buy it when it’s showing a bit of colour to maximise the chances of a successful blooming!